Hephesto's Forge: .....more Necron madness? G'evening everybody, hope you are all having a good week, both in real life and on the tabletop! In the coming three weeks there's a fair chance my posting will be somewhat irregular, which is kind of a funny statement given that most of my time will the consumed by studying for several statistics exams (advanced multivarate and multi-level analysis for those interested). Regardless, I do plan to get at least one substancial post in per week. Following the current wargaming bandwagon, which in book isn't a bad word per se, I might as well throw some more Necron love unto the web. So, later this week I'll be unpacking, examining and testing my first real Finecast mini - the rather gorgeous Cryptek. This mini has been calling to me since the first day it appeared online and will provide an excellent testcase for a Finecast review. Now I have gotten my hands on a few other Finecast minis since the material's release, but I have yet to take one from blister to finished product. Interesting times ahead, not in the least since most of the Finecast minis come with an extensive 'resin' sprue that offers great material for testing purposes. Though the outer sprue frame seems to be denser than the actual miniature, it will help to test how well Finecast resin holds up after a paint strip. 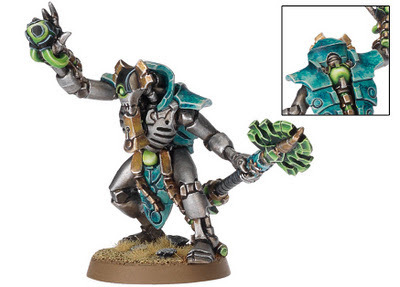 As of right now I'm keeping an open mind, though after examining the basic sprue for the Cryptek (and other minis at my semi-local store) I cannot help but feel that working with Finecast miniatures and bits is certainly one step up from your basic plastic sprue hobby work. Definitely not a problem for somebody who has been dabbling with miniatures for two decades like myself, but for starting gamers I can imagine it will be a challenge. More on this later in the week. Holy cow that is an excellent review series! I just started painting my cryptic. Mine has some bubbles, but overall I just like the mini and any problems can be turned into battle damage! My standard necron overlord model was riddled with bubbles (which destroyed some of his more delicate robe parts) and my Trazyn the Infinite had a huge bubble (hole) dead center of his left shoulder. I know I should have sent them back but I had just got the new liquid green stuff and wanted to try it out. It worked great, and I found the trick was multiple passes of a green stuff 1:1 water mix. Still, shouldn't have to do this on a model straight out of the package... On an up note, my two Crypteks were perfect. 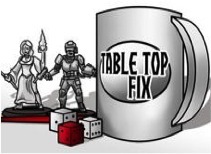 This is something I've seen on a lot of Finecast minis - nothing an experienced gamer cannot fix, but at the cost of the minis their quality control should be much, much higher.